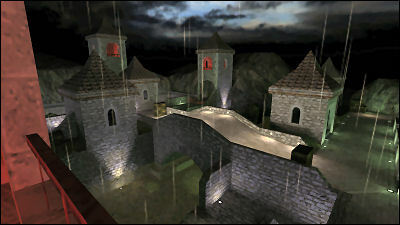 Earlier in the week it occured to me that there was a precursor to de_sienna that I had made, basically to experiment with a few things. The aim was to create a tight-yet-open dark-yet-bright map with action-yet-sneakiness designed for LAN play. 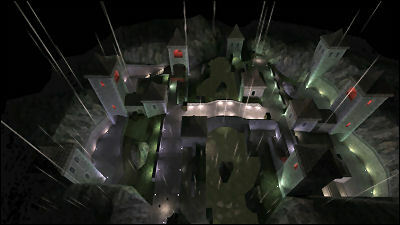 The aim was not a ‘real’ map as such, but something that would be a good blast for a 30-odd minutes. Ultimately, I wanted a small, very dark map that would encourage sneakiness. I like being sneaky in games. 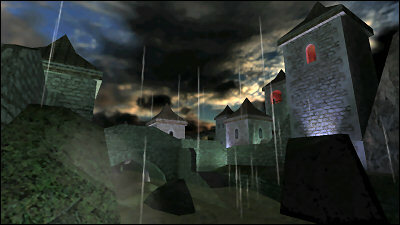 …a rotationally-symmetric map, with bombs, hostages, a load of Quake2-era lighting, colours, darkness, water, rain, lightning and thunder. It had its snipey towers, its hiding spots, its dark concealments and very bright shortcuts. It was quite fun, aside from a few minor bugs with the thunder and lightning. It’s pretty damn dark, but darkness doesn’t really matter in CS 1.6 because everyone just ups their gamma/brightness anyway (NVG are almost obsolete). This came to my knowledge after a rather hefty bout of playing… I was knocked out of a round very early on, so went to spy on my housemates finishing the round. They had their brightness cranked up to the top… they could see everything, whilst I was squinting to make things out, buying NVG every round. I told them to turn the brightness down. I tried to force it. But I realised… I didn’t care. It was more fun to think they couldn’t see me whilst I sneaked around in the dark. It was a challenge trying to spot them from a distance with an AWP in one of the (lit) towers. It was oddly fun. I’m tempted to release it, just for kicks. I haven’t released a non-commercial/official map for a very long time indeed, and never released a ‘fun’ map. Maybe the source too. Hmm. Update: This map is now available for download.